Sporting a very attractive silver finish is just one of the highlights of this female gymnastics dog tag medal. 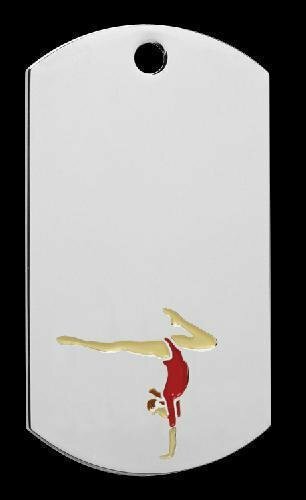 A female gymnast in a red leotard posing as if doing a floor exercise routine is located at the bottom of the dog tag. Measuring 2" X 1" leaves plenty of room on both the front and back to handle any engraving needs. The female gymnastics dog tag can be presented as either a key chain or a neck worn award providing you the ultimate in flexibility.